Thanks for agreeing to feature on ‘Inside DVLA’ Hugh can you tell me why your role was set up? Over the last few years DVLA’s Red Tape Challenge response has delivered a number of initiatives aimed at removing unnecessary burden to motorists and corporate customers. Last year the Transport Select Committee recognised that we provide a quality service to individual motorists. However, they also recommended we develop a better understanding of the needs of our business users, particularly the motor trade and fleet owners and operators who transact with us on a regular basis and in large volumes. This issue was also recognised by the Reilly review of DVLA services. In response to this, DVLA’s Executive Team introduced a new corporate service manager role to the agency. This was set up to get a better understanding of our corporate customers’ needs, to identify opportunities for service improvements and to evidence the benefits that changes could bring. As one of DVLA’s Service Managers what are your responsibilities? My responsibilities are to champion and manage the needs of our corporate customers and to ensure that their business needs are understood. Also to ensure that there is a good evidence base to demonstrate the benefits that changes will bring and that these changes are prioritised fairly against other initiatives being taken forward by the agency. I will work closely in cooperation with other service managers to achieve this and to deliver the changes needed. DVLA has a very busy period ahead as it moves off its current IT contracts, so there is also an important element of managing customer expectations. The service manager structure has provided a better focus on our customer needs in relation to our current and future service offerings. 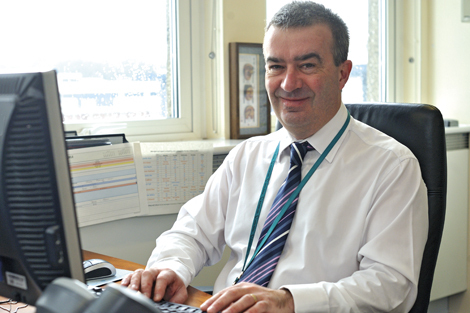 I’ve worked in DVLA for many years – far more than my youthful appearance would suggest – and I’ve never before seen such energy and commitment across the agency to improving the services that we deliver our customers. As it says on the tin we want to make our services simpler, better and safer and that includes the services that we deliver to our corporate customers. Who are your main corporate customers? How do you intend to keep in touch with them to make sure they are up to speed with everything? The agency has already done a lot to understand users’ needs through some great work from our customer insight teams. My team and I have also been out to meet with a number of trade associations and their members to better understand their organisations and business needs. It’s clear to see the passion these trade associations have for continually improving the services offered to their members and they’re keen to work in partnership with us to achieve this. We’re also working with our Communications team to improve the way that we communicate with this important customer group, ensuring that they have a finger on the pulse in terms of the things that are happening in DVLA. We need to ensure that the two way communication lines are clear and that our customers speak with the right people in DVLA – it won’t always be me! How have you approached this role? With great enthusiasm! I have pulled together a great team to support me in the role. It’s an exciting opportunity for us all to make a difference, improve the relationships with our corporate customers, and to work collaboratively with them. providing clear escalation processes – when things go wrong! What are the business benefits of working with corporate customers? By working more closely with our corporate customers we can help industry remove unnecessary burdens, improve efficiency and reduce costs thereby helping to play our part in making UK PLC more competitive. We want to work with you to deliver services that meet your needs. We need your support in not only identifying the need for change but also evidencing the benefits that change will bring or the burdens that will be removed – please help us achieve this. There will inevitably be occasions when we cannot deliver everything that you want or within the timescales that you require. In such circumstances we will commit to having honest open discussions with you to explain the reasons why. To simply make a difference to the way DVLA meets the needs of its corporate customers and to provide services that are recognised as being of a world class standard. On a personal level I would like to catch a few more salmon this season than I have in recent years. It would also be nice if I became revered by my fellow anglers as being such a prolific fisherman that it is rumoured that he is half man and half otter!